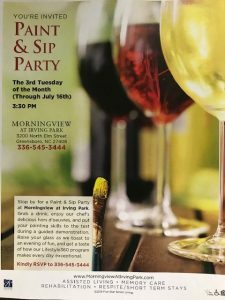 Stop by for a Paint and Sip Party at Morningview at Irving Park. Grab a drink, enjoy our chef’s delicious hors d’oeuvres and put your painting skills to the test during a guided demonstration. Raise your glass as we toast to an evening of fun and get a taste of how our Lifestyle360 program makes every day exceptional. Kindly RSVP to 336-545-3444.